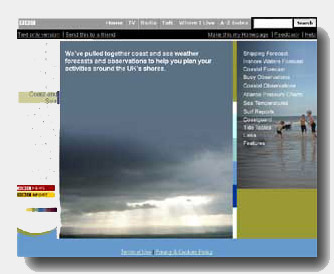 This page brings together a summary of web resources for Tidal Predictions; Inshore Waters Forecast; Shipping Forecast; various weather forecast sites with good visual displays; Synoptic Charts and a Surf Forecast. 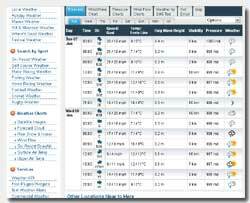 An alternative summary from the BBC is also linked as is Weather2, a comprehensive weather service with a variety of services and historical data. Each site opens in a new window. Print the results (some sites have a "printer friendly" option) and you have everything you need for your trip. The images are only intended to give an idea of each site - the data shown is a "snapshot" at the time the image was created and does not represent current data. 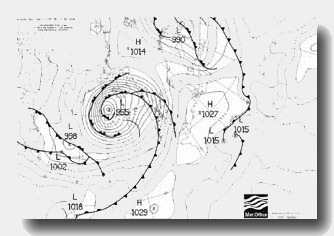 Other useful resources such as an article on Understanding Forecasts, a Float Plan, Moon Phases, Tidal Planning Matrix, MSI times, VHF Protocols and details of UK Coastguard Operational Areas are also included as are links to Marinecall. Click these Menu Headings, or scroll the page. 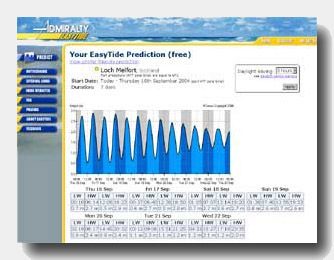 For Tidal Predictions from UKHO "Admiralty Easytide" - free 7 day tidal predictions for a variety of UK locations with a "pay" option to get past or future predictions. Nice graphs and you can save your favourite locations. For FREE Predicitions for the full year, see Tides4fishing.com for a wide range of locations. 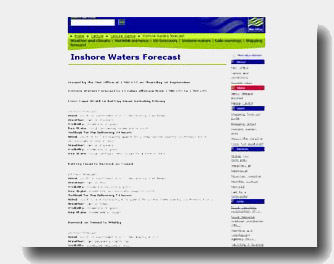 The Met Office Inshore Waters Forecast gives the current situation and following 24 hours for all UK Inshore Waters. The equivalent for Ireland is here. The Met Office Shipping Forecast gives the current situation and the following 24 hours for Shipping Areas in UK waters. Helpful to gain an overview of what's coming our way. A summary and explanation of the format and the terms used can be found here - there is also a chart of the Sea Areas mentioned in the forecast. 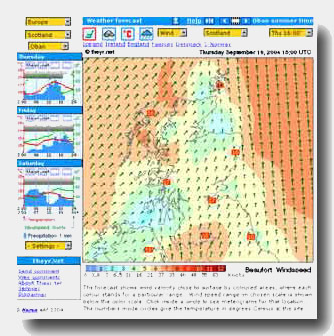 The Theyr Forecast gives a useful 3 day overview of temperature, rain, windspeed and cloud cover. Useful summary graphs indicate this information visually and wind direction is given on a clear map. You can select local forecast data for a range of areas and towns. The XC Weather site provides useful 3 to 14 day forecast data, including wind speed, direction, pressure etc from a variety of UK locations. From the Home page, enter the location you want into the postcode or location input box and hit "enter" to be taken to a screen similar to the image on the left. 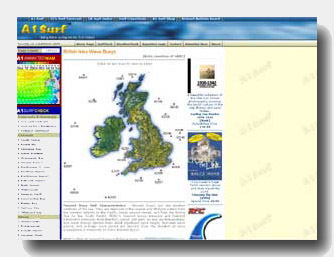 A1 Surf offers a comprehensive Surf Forecast based on information from Wave Bouys around the British Isles. Helpful for the surfers clearly, and also for sea kayakers needing to have an idea of likely sea conditions. The BBC Weather Section provides a Coast & Sea Summary covering the Shipping and Inshore Waters Forecasts, Tides, Synoptic Charts and Surf Reports. 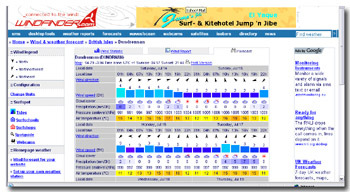 Weather2 provides a highly detailed service, with a wide range of forecast types including marine / sailing forecasts. Windfinder has lots of weather data, and gives a good 6 day forecast in a easily read visual format. The link takes you to a UK map - select your location to pull down info like the image on the left. Easy Reference Sheets - Scotland - Western England & Wales - Eastern England - Summary sheets with paddling speed calculators, wind speed chart, CG contact & MSI Broadcast Times, Marine VHF channels - (.PDF) - intended for printing and laminating so if you would like the Word originals to personalise for yourself, please contact me. Specific MSI and VHF details for Ireland are in this PDF produced by John Rushton - it prints at A4 and then folds up for laminating. Maps overlaid with tidal data - Ricb250 produced this excellent resource. Click into the relevant area until the tidal stream info appears. Coastguard Contact details and Operating Areas for Search & Rescue. The UKSKGB "Easy Reference Sheets" also have this information. 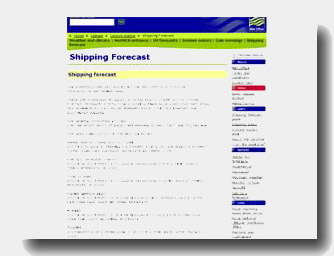 Understanding the Shipping & Inshore Waters Forecasts. Moon Phases - useful for trip planning. Sea Temperatures in UK waters. Marine Safety Information (MSI) broadcast schedules - from the UK Coastguard website - Inshore & Area Forecasts on marine VHF. Similar information for Ireland. See also this draft document (2014) from MCA which includes aerial locations, broadcast times and specific channels for each area. Marine VHF Channels, including details of Working Channels. Mayday / Pan pan / phonetic alphabet - summary of protocols and procedures for VHF emergency calls, and the phonetic alphabet. XTide - free tides to 2037 for most standard ports.